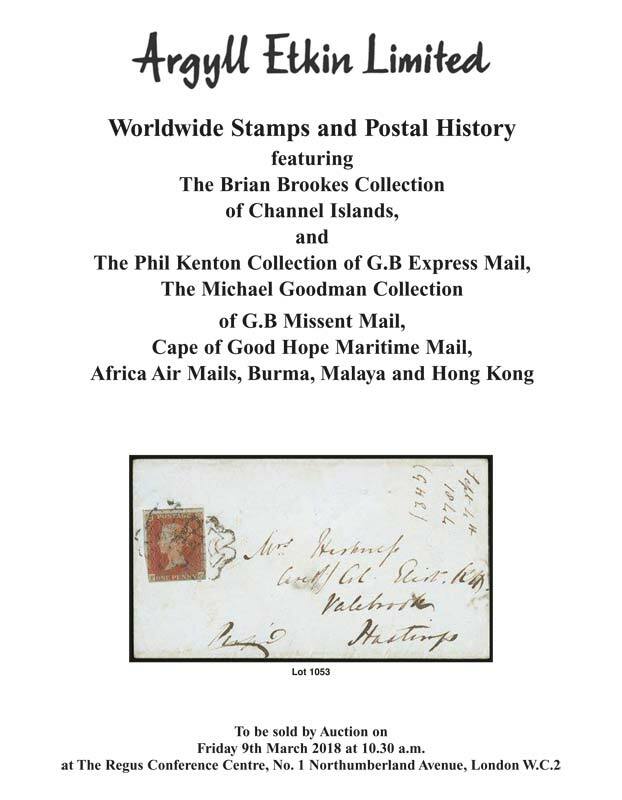 Featuring: The Brian Brookes Collection of Channel Islands and The Phil Kenton Collection of G.B Express Mail, The Michael Goodman Collection of G.B Missent Mail, Africa Air Mails, Burma, Malaya and Hong Kong. Brian Brookes Channel Islands Collection achieves strong results including £11,300 for an 1844 Channel Islands Maltese Cross cover of which only 14 recorded. Argyll Etkin’s Spring Auction began with a superb group of flight covers with a 1926 Cairo to Cape Town survey flight making £1,750. This was followed by a 1927 cover from London to Mongalla, Sudan which reached £1,900 and a 1931 cover flown from Cape Town to London by Peggy Salaman which reached £2,500. A 1935 South African cover bearing 3d and 6d Silver Jubilee stamps flown by Mrs Jill Wyndham and David Llewelyn made £3,200* (lot 16). The pinnacle of the Airmail section was a 1936 cover flown by Amy Johnson, the renowed aviatrice, from Gravesend to Cape town and back to Croydon with two circular Capetown Municipal Airport / Wingfield cachets dated 7th May (arrival) and 10th May (departure) and signed by her. Spirited bidding saw this remarkable cover sell for £6,300* (lot 17). A crash and wreck cover from Sierra Leone to London with a Damaged by Fire in transit, from the BOAC flying boat from Lisbon that crashed into Mount Brandon in Ireland, realized £800. The remarkable 1862 first edition Lallier stamp album, the world’s first stamp album sold for £3,300* (lot 130). Antarctica saw a cover from Bouvet Island bearing Norwegian stamps with the BOUVET / OYA overprint sell for £570. Moving to China, a delightful 1912 block of the 1 cent with red Republic of China overprint with four stamps missing the overprint sold for £1200* (lot 218). A remarkable registered cover to Chefoo, China with the rare Chefoo officially sealed cachet and seals, made £4,600. Africa saw Kenya Uganda Tanganyika 1933 Essays by Vic Groves for three airmail stamps sell for £1,150. An early 1819 pair of letters from a conscript serving on the Eastern Frontier, Cape of Good Hope written from Grijhamstad (Grahamstown) sold for £2000 while a correspondence between 1822 and 1833 concerning slavery in Uitenhage made £3000. An 1876 manuscript cancel from Kommaggas in Namaqualand made £1,050 while a page from a ship’s Captain’s Log Book with four 1d Cape triangulars sold for £880. 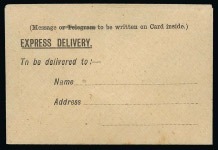 Zanzibar saw a 1916 registration envelope with RNAS censor knocked down for £1300. The Great Britain section began with an 18 page manuscript of a paper written by Francis Freeling in 1804 on how to increase Post Office revenue which sold for £800. The fine Phil Kenton collection of GB Express mail saw three 1892 items from the Charing Cross automatic box experiment sell for £2,500* (lot 798), while a 1909 cover endorsed ‘Express Deliver’ showing railway letter services by two differing railway companies and express fees sold for £1900. A 1951 Express Service E form bearing KG VI 5s, 2s6d and 7d with London NW district office postmark sold for £700. * (lot 817). Ship letters saw some rare items with a 1798 manuscript ship letter of Bervie, one of just two recorded examples, which sold for £4,200* (lot 861). The celebrated 1d Mulready envelope in a complete uncut sheet of 12 sold for £2,100. An 1866 entire letter from Leeds to Saxony charged an extra 2d for sending by the special â€˜northern towns’ train to London sold for £1,100. The Brian Brookes Channel Islands collection, probably the finest Channel Islands collection to be on the market for 40 years, opened with a letter from Durrell Sausmarez during the American War of Independence to Thomas Sausmarez in Guernsey which sold for £1,300. The fabulous 1844 cover with two clear Channel Islands Maltese Cross strikes of which only 14 examples were recorded in the Rockoff and Jackson listing reached £11,300. * (lot 1053). A superb pair of £1 King Edward VII stamps fine used with a Guernsey cds on a 1911 green parcel post label brought £1,550* (lot 1073) while a 1906 large piece cut from a parcel sent to London containing 1,000 small cigars with a Guernsey parcel cancel brought £3,100. An 1857 entire letter from the British P.O. in Constantinople to Jersey with GB 6d pair each cancelled ‘C’ and a ‘Registered letter’ handstamp brought £2,500* (lot 1087). 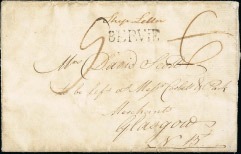 An 1842 entire from Rio de Janeiro to London backstamped step type Guernsey / Ship Letter reached £2,400. This cancellation was only used in 1842. An 1842 entire from the French postal agent in Jersey to Paris requesting a supply of wrapping paper and sealing wax given the large volumes of express packets every day to St. Malo and Granville brought £1,000. An 1871 Boules de Moulin from Jersey to Paris stamped at the special 1 franc rate sold for £1,300. 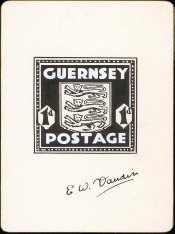 World War II material was popular, and included the Guernsey 1941 1d Occupation issue original handpainted essay in the issued design in black ink and Chinese white signed by E.W. Vaudin which sold for £4,750* (lot 1303). 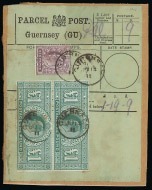 A Jersey 1943 set of 6 presentation die proofs made £1,100. The Jersey 1969 inauguration of Postal Services proofs including unissued designs on Harrison cards made £1300. Finally a delightful entire letter dated 1831 from Jonathan Duncan on Herm sold for £1,100. A remarkable sale with many unique or distinctive items. Argyll Etkin’s next sale in September 2018 will feature fine British West Indies, Burma, Napoleonic Wars with Nelson and Napoleon letters as well as an outstanding China stamp collection.